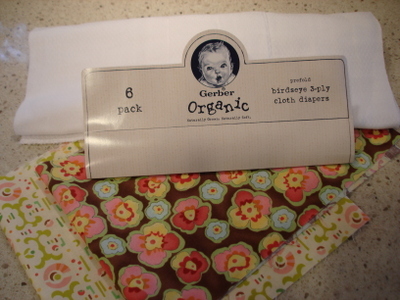 Some 3-ply cloth diapers, scraps of fabrics two inches longer than the diaper and two inches wider than the center fold. 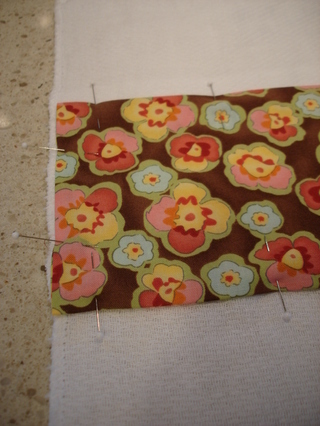 Some pins, white thread, scissors, a sewing machine with a zig-zag stitch and a steam iron. First, pre-wash the diapers with baby laundry detergent or at least 'free and clear' stuff. Put the diapers in the dryer to shrink. 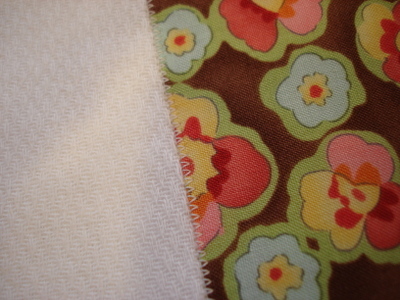 Cut the bands of fabric to be 2 inches longer than the diaper you are using and 2 inches wider than the center fold. 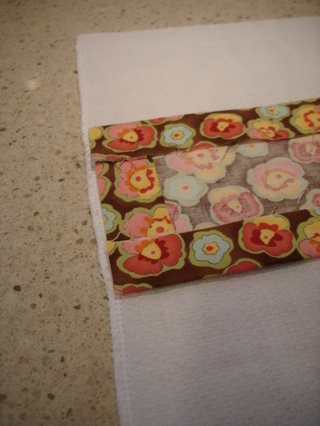 Now, fold under and steam press each short side so that it's about a 1/4" smaller than the diaper. 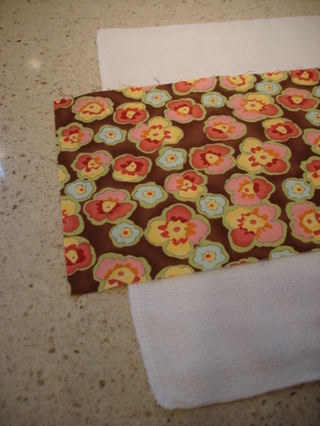 Repeat this process on the long sides to fit the center fold. 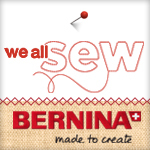 Set up your sewing machine with white thread and a really small zig-zag such as 2 mm wide and 1mm long. If you have a computerized machine set the needle to stop down. If you have a manual setting sewing machine that fine too, don't worry about it, just choose a tiny zig-zag and try to stop with your needle down when you are ready to pivot.Sew along the side of the fabric band overlapping the edge with you zig-zag. I like to start with a short side. If stretching occurs ( and it will), don't hesitate to make tiny folds, once the cloths are washed again those disappear. a pretty simple project for such a sophisticated piece of equipment, but it makes quick work of things! Wow!! the process is really quick and simple, I just love it. You made the process look so simple and encouraging for newbees like me! They look great in their colours and I wanna try them as quick as possible, so can you please help me out in doing this with more of your posts???? I find that was very useful! Cute, and a great use for prefold diapers. 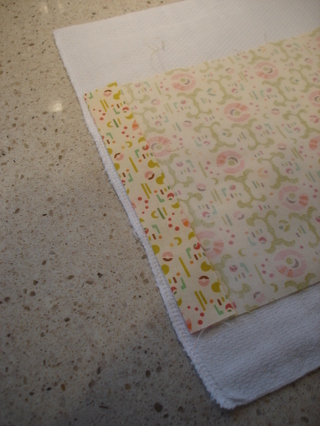 If you want even cuter burp cloths, look for colored prefolds. Do you have any suggestions on what type of fabric to use? I have seen a lot of tutorials that suggest flannel because it's absorbent.. Okay, I'm old, very.. planning to make these for a grand I should've gotten 15 years ago, so tell me, do you leave the outside panels on the diaper? It appears that way in the pic, and if so, does the mom just fold them under? Sorry, haven't had a chance to sew in ages, and even longer since having a baby. Thanks for posting! I made a few and they are super cute! Hi!! I'm just wondering how the back looks after you have sewed your fabric on. Does it still look nice even if you can see all the thread on that side? Is there a trick to not see it? 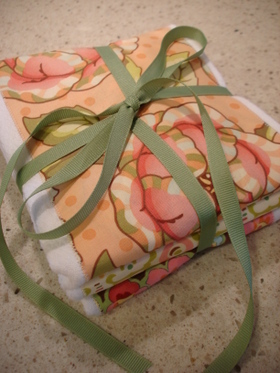 Thanks for helping hands and giving a great deal of tips to prepare a baby cloth diaper. Cloth diaper should be preferred to the market diaper with reference to the less cost and easy preparation. Further the rashes which are formed in the baby area and which generally occurs in the market diapers are less in case of the cloth diapers. The latter is also washable and can be reused at a later time. This was exactly what I was looking for and it was easy to follow. Thank you very much for posting this. 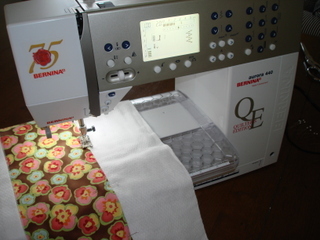 Did you use cotton fabric or fleece?